Background: Laparoscopic sleeve gastrectomy (LSG) has recently gained support as a single-staged and stand-alone bariatric procedure. Reports of excess weight loss of 51-83%, reduction in patient co-morbidities, and decreased operative morbidity compared to laparoscopic gastric bypass have garnered support for LSG. 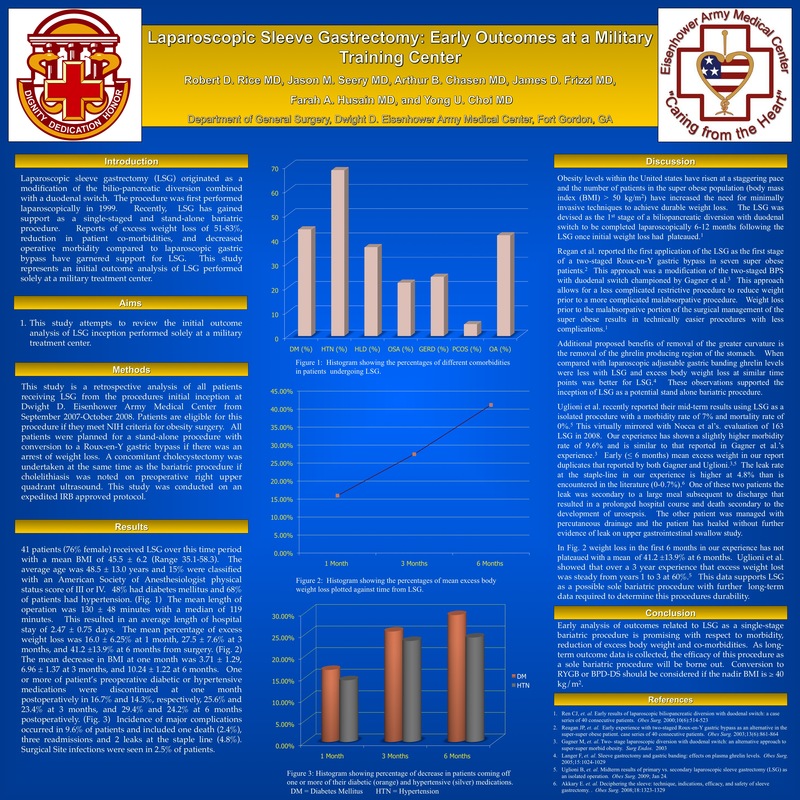 This study represents an initial outcome analysis of LSG performed solely at a military treatment center. Methods: This study is a retrospective analysis of all patients receiving LSG from the procedures initial inception at Dwight D. Eisenhower Army Medical Center from September 2007-October 2008. The patients were planned for a stand-alone procedure with conversion to a Roux-en-Y gastric bypass if there was an arrest of weight loss. Results: 41 patients (76% female) received LSG over this time period with a mean BMI of 45.5 ± 6.2 (Range 35.1-58.3). The average age was 48.5 ± 13.0 years and 15% were classified with an American Society of Anesthesiologist physical status score of III or IV. 48% had diabetes mellitus and 68% of patients had hypertension. The mean and median length of operation was 130 ± 48 and 119 minutes and resulted in an average length of hospital stay of 2.47 ± 0.75 days. The mean percentage of excess weight loss was 16.0 ± 6.25% at 1 month, 27.5 ± 7.6% at 3 months, and 41.2 ±13.9% at 6 months from surgery. One or more of either preoperative diabetic or hypertensive medications were discontinued at one month postoperatively in 16.7% and 14.3%, respectively. Incidence of major complications occurred in 9.6% of patients in this study to include one death (2.4%) and three readmissions. Conclusion: Early analysis of outcomes related to LSG as a single-stage bariatric procedure is promising with respect to morbidity, reduction of excess body weight and co-morbidities. As long-term outcome data is collected, the efficacy of this procedure as a sole bariatric procedure will be further characterized.